Please see https://releases.xamarin.com/preview-xcode-9-gm-ios-11-support-preview-9/ for the details about this release, including installation instructions and links to the downloads and release notes. These are preview builds to allow Xamarin developers to start trying the new features available from Apple in the Xcode 9 GM seed. Any bug reports about the new Xamarin bindings are much appreciated! File a bug report against Xamarin.iOS 10.99 if you see any suspicious behavior in this preview Xamarin.iOS version that you wish to report. EDIT July 27: Update title and Release Blog link for preview 2. EDIT August 03: Update title and Release Blog link for preview 3. EDIT August 11: Update title and Release Blog link for preview 4. EDIT August 18: Update title and Release Blog link for preview 5. EDIT August 25: Update title and Release Blog link for preview 6. EDIT August 31: Update title and Release Blog link for preview 7. EDIT September 08: Update title and Release Blog link for preview 8. EDIT September 13: Update title and Release Blog link for preview 9. I updated VS for Mac, Mono and Xamarin.iOS but I don't see any of the iOS 11 simulators in the dropdown box. I also have Xcode Version 9.0 beta 3 (9M174d) installed along with iOS 11 simulators. I can successfully build and deploy swift iOS 11 project to iOS 11 simulator from Xcode. I would like to be able to test some of the new iOS 11 API's in simulator. Maybe haven't configured something? When I switch Supported architectures to x86_64 my project builds fine for generic simulator. But I still don't see any of the iOS 11 simulators. A few restarts later I can see all of the iOS 11 simulators in a dropdown box. So everything appears to be fine. I would file a bug report but it would be hard to reproduce the issue that I had. Thanks for that @AndriusKirilovas I had the same issue where the simulators would not show until I changed preferences. This info should have been included in xamarin releases blog. I have the same problem with Visual Studio BETA 7.1. I do not see the simulators. I gave an ALPHA version of Visual Studio 7.1 (less recent than BETA) and I have the simulators. On my iMac or I also Visual Studio BETA 7.1, I see them correctly. I tried to put the BETA version back on my MacBook but still no simulators. I have downloaded latest xamarin software for xcode9 beta 6 from link mentioned by Brendan above. Is there any workaround please? This file has been edited in a version of Xcode which is unsupported by the designer. Documents saved in Xcode 9.0 format, or older, are supported. I downloaded Xamarin.ios, Xamarin.mac from the above link. sdk path is pointed to /Applications/Xcode-Beta.app. But on my iPad, which is running IOS11 Beta 10, I ran into an exception when calling an https web service. I don't see this error in iPad running earlier versions of iOS. I confirmed with the web service server host, they are running security protocol TLS1.1 + compatibility. I have update my mac to support the iOS 11 features. When i tried to deploy app into simulator i have faced below problem but in device i can. Xamarin.Mac not installed. Can't find /Library/Frameworks/Xamarin.Mac.framework/Versions/Current/Version. Please help me to figure out the issue. Could not load the framework 'CoreSimulator' (path: /Applications/Xcode.app/Contents/Developer/Library/PrivateFrameworks/CoreSimulator.framework/CoreSimulator): not found. I just updated Xcode to 9.0, and updated VS Mac with everything in the stable channel. All the simulators are there and run fine. It's as if VS Mac doesn't know where to find them. I just updated Xcode to 9.0, and updated VS Mac with everything in the stable channel. In case it's helpful, there is a new Xcode 9 compatibility support preview available today based on the Xcode 9 GM seed in particular. Note that these Web Previews require installing a couple extra packages by hand on top of the current Stable channel versions. Not very helpful. Why doesn’t this stuff just work? It’s the reason I stay far away from Xamarin. Unfortunately a couple of my clients haven’t converted to native yet and I still have to waste time with this sorry product. Thought MS would turn it around but I guess not. Sorry to be so blunt, but this really isn’t a tool for professionals. > I just updated Xcode to 9.0, and updated VS Mac with everything in the stable channel. > In case it's helpful, there is a new Xcode 9 compatibility support preview available today based on the Xcode 9 GM seed in particular. Note that these Web Previews require installing a couple extra packages by hand on top of the current Stable channel versions. I'm not sure that level of hostility is warranted in reply to the simple notification about availability of new versions that I was providing. If you're curious why the Xcode 9 compatibility is not yet published on the Xamarin Stable updater channel currently, one important reason is that Xcode 9 itself is currently a GM seed and not yet final. For example, it is not yet available as an update from the App Store. In that sense, Xcode 8.3.3 is still the "Stable" version of Xcode. 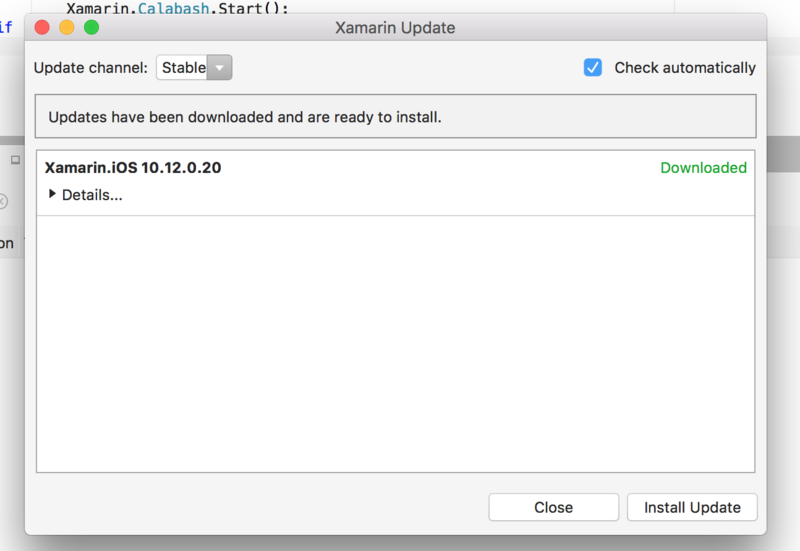 Accordingly, Xamarin follows a convention that the Xamarin Stable updater channel will remain aligned with Xcode 8.3.3 until Xcode 9 is published to the App Store. One problem this prevents is error messages for users who are still using Xcode 8.3.3 and have not yet installed the Xcode 9 GM. When Xcode 9 compatibility is published to the Xamarin Stable channel, those users will start seeing "Error MT0091: This version of Xamarin.iOS requires the iOS 11.0 SDK (shipped with Xcode 9.0) when the managed linker is disabled. Either upgrade Xcode, or enable the managed linker." (This error arises because Xamarin.iOS 11 of course must include the new native symbols from iOS 11 to be useful.) One example of users who would hit this error would be brand new users who are setting up Xcode (from the App Store) and Xamarin for the first time today. Is there an expected timeline for adding iOS 11 support into the Stable build after Xcode 9 and iOS 11 are officially released next week? I have read that Xamarin has typically had same-day support for new iOS releases, but I am not sure if that means that it gets moved to the alpha channel and then must progress through beta before reaching the stable channel, or if the preview releases replace the standard alpha/beta process. I'm just trying to decide whether to stick with the iOS 10 SDK or if I can expect to be able to upgrade via the Stable channel for a release later this month. Barring unusual complications, the plan will be to publish Xamarin.iOS 11 to the Stable updater channel and Visual Studio 2017 within 1 day of the when Xcode 9 final is published to the App Store. 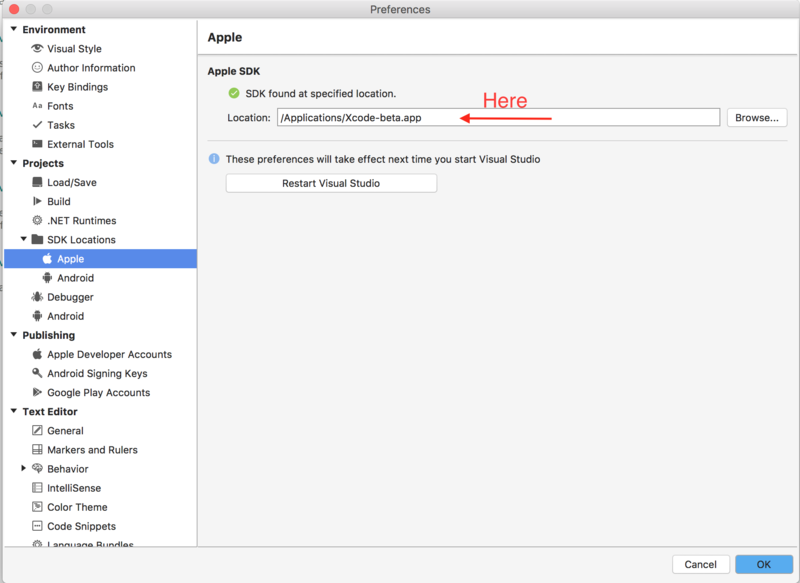 As one small piece of additional information, the process for coordinating Visual Studio 2017 releases with Xcode releases is fairly new, so there is a small chance that that process might introduce an unusual complication. With the latest preview and the Xcode 9 GM I've had issues editing storyboard files in Xcode. When clicking on a ViewController, it seems it cannot find the matching .h file as if the project is not fully initialised by Xcode. If you select the matching header file manually it says it can't create outlets for example because the file doesn't belong to the controller. Reverting back to the stable channel and Xcode 8 fixed this problem immediately. Is this an issue known by other people? I'm quite afraid not a lot of people have tried this combination yet. I've just installed the latest stable updates for Xamarin, and the bug still persists with all my projects. As a work-around, it's possible to enter the outlet in code manually, and then just drag the line from your control to that piece of code. So it can't generate the outlet in code for you (anymore), but luckily, you can still do it manually. For updates on the outlet issue, please continue to follow the Developer Community and Bugzilla items mentioned above.